Our Cafe Au Lait Cheesecake tops our selection of Free Cheesecake Recipes! 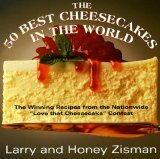 Our selection of free cheesecake recipes offers you a wide selection to choose from. On this page we're featuring a Cafe Au Lait Cheesecake that got good reviews from my friends when I served it. The recipe was originally from a Better Homes and Gardens but I "tweaked" it a bit. When you make any of our free cheesecake recipes, please let us know how you rated it by clicking here. Thanks to Meg for sharing this photo of her Cafe Au Lait Cheesecake. Meg has a blog where she photographs everything she eats. It's a hoot!. Okay, happy baking and good luck with this recipe! Preheat oven to 350°F. In a bowl combine the cookie crumbs and melted butter. Blend until all the cookie crumbs have absorbed the butter. Press into the bottom and 2 inches up the side of an 8-inch springform pan. Set aside until needed. Using a small saucepan, combine the chocolate, water, and espresso powder. Place over low heat and stir until the chocolate begins to melt. Remove from heat. Continue stirring and add the liqueur. Cool. Combine the cream cheese, sugar, flour, and vanilla in a large bowl. Mix with an electric mixer (or by hand, as I do) until smooth. Add the eggs, one at a time. Beat on low speed just until combined. Set aside 2 cups of the mixture, cover and chill. Stir the chocolate mixture into the remaining cream cheese, and when blended pour into the crust lined pan. Bake about 30 minutes or until edge is set (cheesecake will not be done). Now, remember the cream cheese mixture you set aside in the fridge? Go get it and pour it around the edge of the cheesecake (where the cake has "set"). Now, gently spread the cream cheese over the entire surface of the cake. Bake for another 15 to 20 minutes or until the center of the cake appears nearly set when gently shaken. Remove from the oven and cool on a baking rack for 10 minutes. Loosen the crust from the side of the pan by running a knife around the edge of the cake. Cool for 30 more minutes. Remove the outer part of the pan and cool cheesecake some more. For garnish, drizzle with additional melted chocolate if desired. This cheese cake serves 12 people.